High moisturizing sunscreen protection. This ensures a highly effective protection thanks to the incorporation of titanium dioxide in its formulation. Protects skin from UVB rays, which cause sunburn, and of UVA, which generate free radicals responsible for skin oxidation, one of the main causes of premature skin aging. The most potent anti-aging weapon against the damage caused by UV radiation, is without a doubt the sunshield. However the sunscreen only blocks 96% of UV radiation, but not all free radicals. In this sense, the expert team of SkinCeuticals laboratories has developed a preventive antioxidant serum, combining UV protection with the neutralization of the assaults caused by free radicals. Apply daily, a generous amount on the face, neck and neck. Supplementary protection of an antioxidant. Shake before use! Does not stain. Attention! This product does not provide protection against sunstroke. 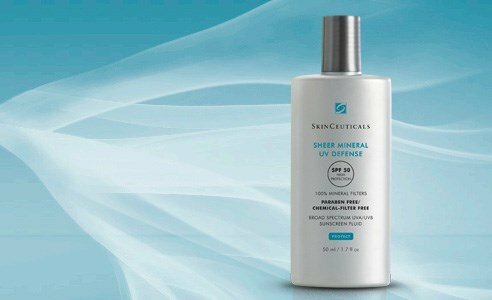 Formulated with Z-COTE® based on transparent zinc oxide, the SkinCeuticals protectors offer a UVB protection / spread spectrum UVA - the skin is protected from harmful UV rays and not just from sunburn. Unlike sunscreens based on white and pasty zinc oxide formerly the SkinCeuticals protectors are formulated with cosmetically elegant textures. Protect line - SkinCeuticals aims to an effective protection against photoaging.